I’m not going to pretend that you can’t drink beer properly without the right kind of glass to serve it in. A pint glass or beer mug will do a fine job. 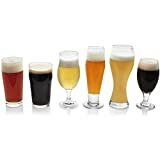 However, there are many different beer glass types out there, all made with a different purpose and designed to hold a specific type of beer. Using the appropriate glass can ensure that your beer drinking experience is the best it can possibly be. Who are we to complain about that? Instead of ignoring this advice and pouring our beer into any old pint glass that’s clean in the cupboard, we thought it would be wise to educate ourselves (by ourselves, we mean you), on the finer points of beer glassware. In this guide you will learn the proper type of glass to use for each type of beer, what they look like, and where to buy them. Problem solved. The most typical and classic type of beer glass is the pint glass. You may even serve your water at home in a pint glass. It’s a great glass – wider at the top than at the bottom and cylindrical in shape. The shaker pint was originally used as a mixing glass for bartenders, but since they were always around at the bar, they soon became most used for beer. 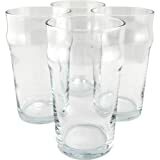 These glasses are what we typically serve our homebrew in, because they’re very versatile. The pint glass featured in the image above is a shaker pint, which is typically used in the U.S. and holds only 16 fluid oz. The nonic pint, pictured here, has a distinctive bulge at the top, and it holds an Imperial pint, which is 20 fluid oz. These are typically used in the UK and Europe. You might think the bulge in the glass must help it deliver a better beer experience, but it doesn’t. In fact, neither pint glass was originally designed with the beer in mind. The bulge on the nonic glass wasn’t added to enhance the beer, but to make them easier to stack, so they didn’t stick together, and presumably so they were easier to hold. A third type of pint glass is what has become known as the Guinness pint glass, though it’s actually called a tulip pint glass or Irish imperial pint. Guinness chose this style of glass because it’s best for serving porters, stouts, and other nitro beers. You can see these glasses in action at the Guinness Gravity Bar in Dublin. Unlike typical tulip glasses, the pint glass doesn’t have a stem, and it has a less pronounced mouth. It’s good for showcasing the deep, dark color of a porter or stout, while helping to retain the head. While you probably won’t get extra enjoyment from serving your beer in these glasses, but it has become the norm for serving the beers listed above. The Pilsner glass was intended for a specific beer – a pilsner, like Pilsner Urquell (the first ever pilsner to be brewed, in the Czech Republic. Read more about the Prague beer scene here). It’s a tall and slender shape, and shows off the sparkling carbonation of the light beer that it was intended for. The wide mouth of the glass helps to maintain the foamy head of the beer, and to showcase the flavors and aromas of the beer. A pilsner glass can come in a variety of sizes. Typically it holds less than a pint glass. 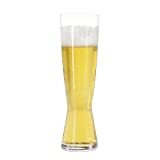 In the UK and Europe, a Pilsner glass holds between 25cl and 33cl (or 8-11 ounces), but in the United States, it’s not uncommon to find 16oz pilsner glasses. Unlike the pint glass, pilsner glasses were designed with the beer in mind, and they are the best glass for enjoying a light beer or lager. Saying a German beer stein is sort of like saying French fries. The word stein in German means stone. That’s likely how the beer mug got its name, because it’d often made from stoneware, porcelein, or something similar. It’s basically a large beer mug with a lid and it can be very decorative. It’s become a very popular tourist souvenir when visiting Germanic countries. However, Germans drink beer from weizen glass, which we’ll speak about next. 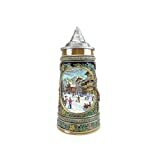 If you want to drink your beer from a German beer stein, go for it! You can serve just about any type of beer in a stein as you want. The tulip glass is very appropriately named. It’s in the shape of a tulip. I personally love tulip glasses. Not only are they an attractive way to serve beer, they are one of the glasses that showcase beer the best. The tulip glass has a bulbous body that helps trap the aroma, and a mouth that flares slightly at the top to help maintain a nice frothy head, as well as release the flavors and aromas of hoppy and malty beers as you sip. This is why the tulip is best Belgium beer glass. It’s perfect for serving strong IPAs and malty Belgian beers. A tulip glass can come in many sizes, but it usually has a short stem and round bowl – though the bowl size often varies. The height of the glass will be around 7 inches tall, and it will hold about 13 fluid ounces. There is also a glass called the thistle that looks similar to a tulip glass, but with a smaller bowl and longer neck. 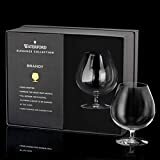 A snifter glass is used to serve cognac or brandy, but it can also be used to serve bold beers with high-alcohol levels. 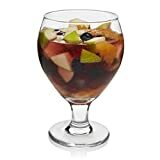 These beers, like a barleywine or Belgian triple, benefit from the shape of the snifter, which holds in the sometimes overpowering boldness of these beers and allows them to open up in the glass, to release their intense aromas and flavors in a control, slow way. The small mouth opening of a snifter glass does just that. You will want to drink a beer like this slowly and enjoy its complexity, so a snifter glass is the perfect serving vessel. If you order a beer in Germany, it will likely be served in a weizen glass (unless you’re at Oktoberfest, where the beer is served in 1 liter beer mugs. A weizen glass has a similar shape to a pilner glass, but the weizen glass is more curved and ends in a smaller mouth. They are used to serve wheat beers (weizens). The tall, curved glass helps distribute the flavor and aroma up to slightly smaller mouth. A nice frothy head forms at the mouth and as you take a sip, the full flavor and aroma typical of a weizen, like banana-esters and orange spice, hits you. The glass is a bit bigger than the pilsner glass, as it typically holds about 1/5 liter of beer. I’ve definitely seen much smaller version of this glass as well, usually at bars where they want you to have the choice to order a smaller beer. You may find Belgium beers and strong beers being served in a goblet or chalis instead of a tulip or snifter glass. A goblet is a large bowl-shaped glass that give a feeling of weight to the beer you’re drinking – both literally and figuratively. A heavier, more robust beer does well in a large glass like this with a large mouth to disseminate the full flavor and body of the beer. A chalis is very similar to a goblet, if not exactly the same. It can be more ornate and heavy. Chimay serves its beer in a goblet, as do many other breweries with bold strong beers. Of course, there is always room in our beer glass cabinet for a beer mug. We have a typical 1 liter mug used for Oktoberfest, as well as much smaller, pint-size mugs. Obviously the pint-sized mugs are much more practical to have at home. When will you just be sitting around home drinking a liter beer. Mugs are great for drinking beer because they have a handle. That makes them easier to hold, especially when they’re really large, like a liter. It also helps to keep the beer cold, because you’re not grasping it with your warm hand. 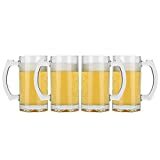 As with the German beer stein and many goblets, the beer mug comes in many different styles and has become somewhat of a collector’s item and ubiquitous tourist souvenir. 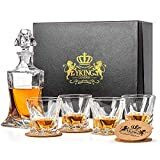 If you want to make it easy on yourself, one of the best ways to fill out your collection of beer glasses and have everything you need is to buy a sampler beer glass set. This set comes with a pilsner, weizen, nonic pint, shaker pint and tulip glasses. To make a set of 2 or 4 or 6, all you have to do is buy the necessary number of boxes. We’ve used these ones at home for many years and we’ve never broken even one. They are a good, sturdy glass, and dishwasher safe. As you can see, there are so many different choices when it comes to serving your beer in the proper glass. Even if you have just two or three of these beer glass types at home, you’ll be able to enhance your beer drinking, and serving it will be a whole lot more fun too. Like this post? We’d love for you to share it on your Pinterest board and help get the word out! How Much Do You Know About Colombian Coffee?